This recipe is from Mark's Daily Apple. I switched some of the proportions around and named it after my all-time favorite Christmas cartoon, but all credit goes to the amazing health resource that is MDA. I've very much enjoyed working with root vegetables lately. They're durable, they last forever in the refrigerator, and they're tough to screw up. 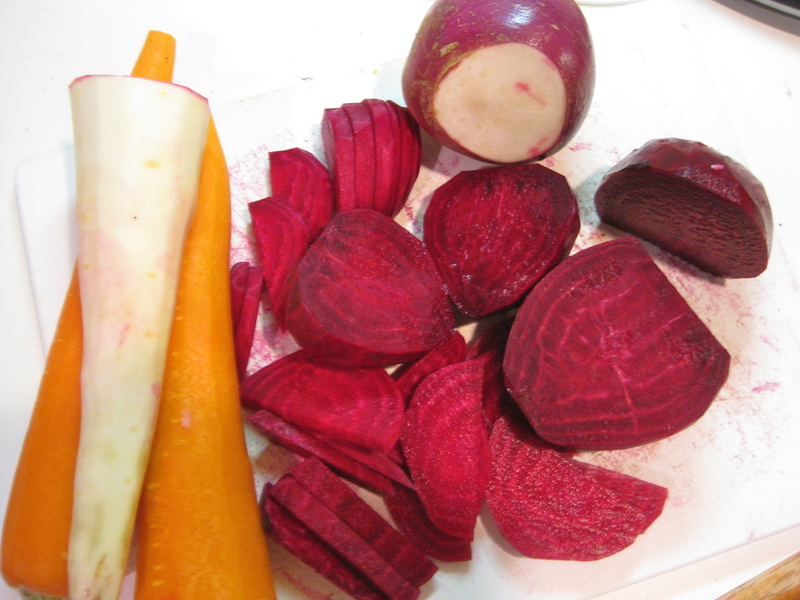 Beets make quite a purple-y mess. Look out. I've even updated my Sweet Parsnip Mash recipe. You can imagine my giddiness, then, when MDA posted a Vegetable Hash recipe. Add shredded pork shoulder and you've got a work of art. Top the whole thing with a fried egg and you've delivered art an elegant and delicious punch in the mouth. Season a 3-4 lb. 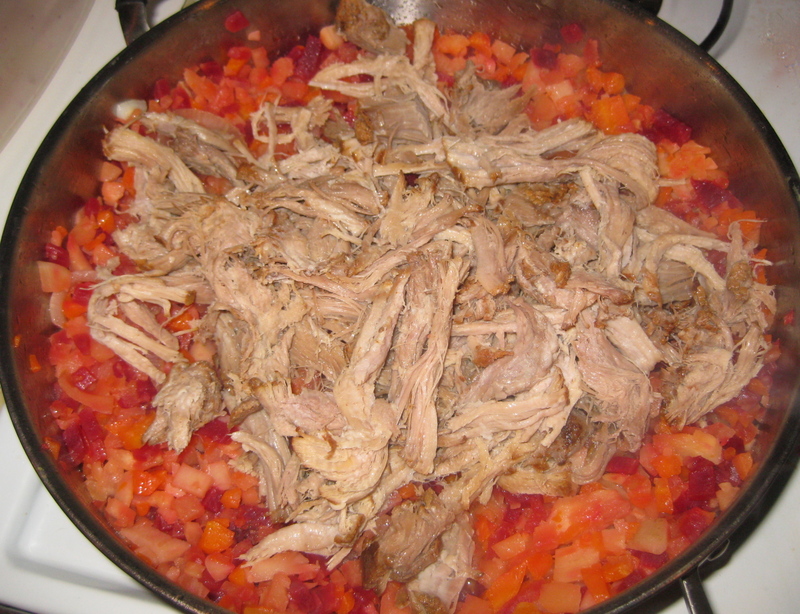 shoulder of pork (tied with cooking twine – it will fall apart when slow-cooked!) with a simple BBQ rub or paprika. Add a few cups of broth and place fatty-side-up in the slow cooker (this won't yield the smoky flavor of pulled pork, but you won't miss it in this hash). Cook on LOW for 10 hours. The finished product will almost melt in your hands – I prefer to separate the meaty portions from any fat that remains. Allow to cool, then shred. First, boil the chopped veggies for 15 minutes to soften. Drain. 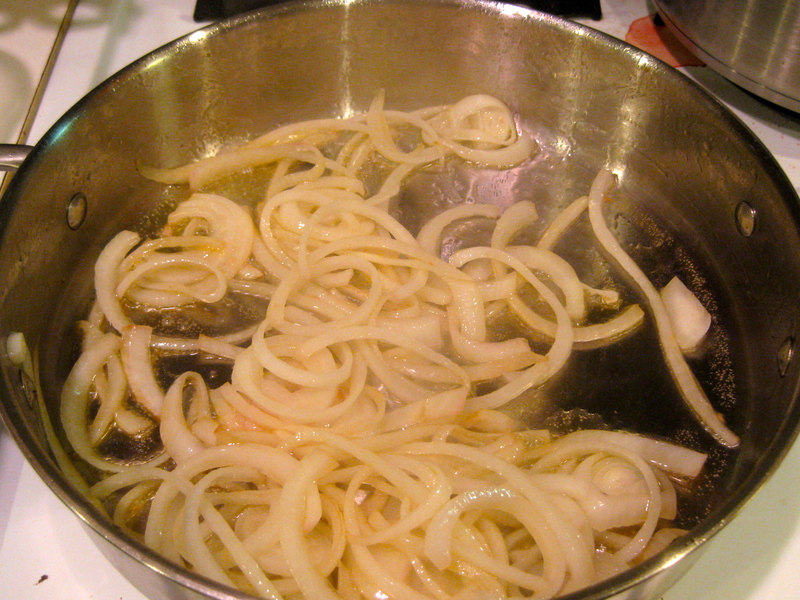 Saute the onion in 1 Tbs. ghee until soft. Warning: Cooking with ghee makes your house smell like the Amazing Factory. 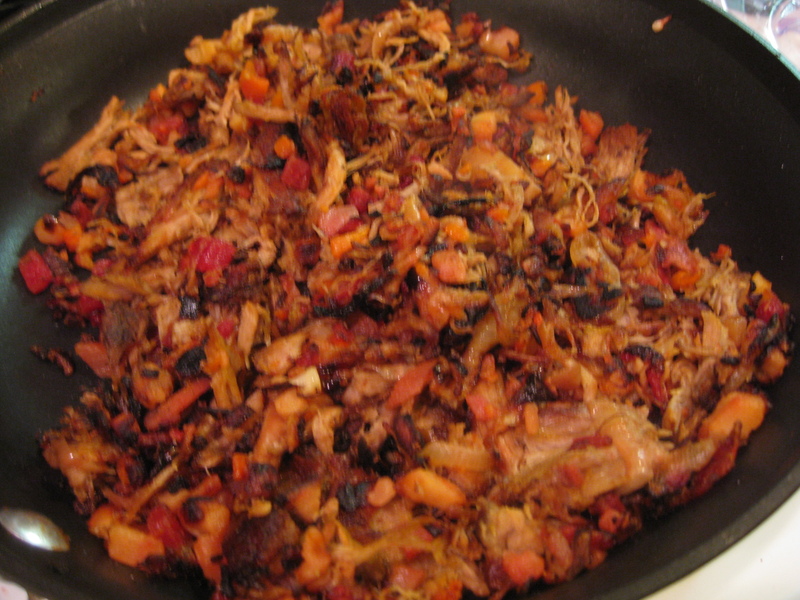 Add the chopped root vegetables, the rest of the ghee, and the shredded pork. I had to divide this into 2 separate pans...I should've made more! Mix everything together in the pan to combine evenly. Allow to cook on medium-low until the mix at the bottom has browned (10 minutes or so). Then stir and repeat to brown the entire mix. It took me about 45 minutes to get the hash nice, brown and crispy. My version of "Who-Hash." The veggie portion will definitely be making an appearance at Thanksgiving & Christmas in place of stuffing. Me: Did you try the hash for breakfast? Husband: It was great. I might take it for lunch. And eat it for dinner. Me: Save some for me! Husband: No. Because I'm a mean husband and I'm also not buying you any jewelry or puppies today. Don’t knock Arby’s. They have delicious chopped fresh salads, with no leftover lettuce doomed to wilt and die in my fridge crisper. Even fast food places are beginning to meet the public’s new demands for real nutrition. I got some organic (free range) eggs in Hy-Vee’s organic foods aisle yesterday. I look forward to examining their flavor soon. My problem is using up what I buy in a timely manner. I usually buy eggs 6 at a time and keep them too long. What am I going to do with 12? I came of age as wife/cook when the menu was dictated by the season and Gramp’s garden. Asparagus, strawberries, sweet corn, tomatoes, green beans, okra — whatever Gramp brought in to the kitchen — was duly relished in its turn. “Waste not, want not” is ingrained into me. Root vegetables, squash, persimmons, etc., were winter staples. I canned, froze, bottled, the excess in its peak season. Made watermelon pickles, red pepper/onion relish, etc., etc. Gooood eatin’! Restaurant food will never be as tasty as fresh-from-the-garden, no matter how French or Italian they name it. It’s peach season now — gorge! I’m planning on planting a garden eventually – another reader, Heather, has an awesome garden and I’ve kept it in mind ever since I first saw it. There’s also a canning class in Princeton – free – that I thought about checking out, but I decided to go with seasonality instead! Are there any local sources of eggs near you? When you buy nearly straight from the hen your eggs will keep more than a month in the fridge, and that’s a conservative estimate. Store-bought eggs are usually weeks old by the time they reach your fridge. Can you use 12 farm-fresh eggs in 6 weeks?